Ginger is a tropical plant that has been cultivated since prehistoric times. Ginger is often found dried in the spice section of your local super market. 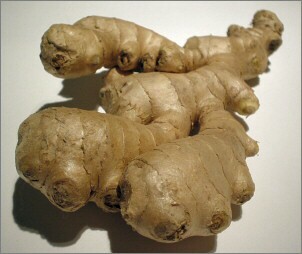 However, in most Asian and in Japanese cooking ginger is always used fresh. Ginger can used in everything from desserts to pickles to meat and fish. The flavor of ginger is bright, floral, citrusy and spicy. Cooking ginger will soften its taste and pungency. Ginger keeps well in the refrigerator, so it’s an easy ingredient to have available fresh at home. Choose ginger that are firm. Peel the skin off before using with a small paring knife.